The border crossings were a breeze. 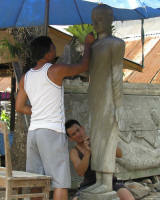 The Laotians wanted overtime pay because everyone paid it. I said they either were expected to do their job or they should close the border, we were not paying. Poor guy had no answer to that. So we didn't pay. There were few noticeable differences between Cambodia except a few more brick plastered houses - still on stilts. The 4,000 islands (in the Mekong) are rated by the LP as steamy so we were definitely not going to visit them. In any case we are not sure that we could get the van across. We did stop at Khone Phapheng waterfall. This is really rapids between the river bank and one of the river islands. It is the largest by volume in South East Asia and spreads over a wide area. Definitely a tourist centre for Laotians who were out in force because of the Buddhist New Year. 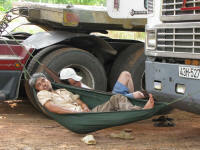 It is a pity we had not changed dollars to Kip in Cambodia as the exchange rate was very bad. Mind you this may not have been possible but we didn't even try. I had sticky rice with banana and coconut for lunch. Then it was on to Champasak a one time capital in the 5th century of the pre Angkorian Empire. Eventually the capital was moved to Angkor as the area controlled became larger. 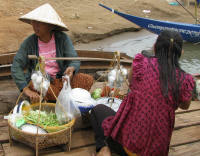 It is now a quiet little town spread out along the banks of the Mekong. My only complaints are that there is no cell phone coverage for MTN subscribers and internet is so slow it is useless. No communication with the outside world! There is a car ferry across the Mekong. The ferry is 3 boats held together by a wooden platform and looks rather like a 3 hulled catamaran. It has a diesel engine so propulsion is not a problem. The boat leaves when there are 6 cars on board. We were number 4 in the queue and had to wait for number 5 to arrive and take up the last position on the side so we could go in the centre. Sensible as we were definitely heavier than the other cars. Children were swimming in the river nearby, jumping off a platform and thoroughly enjoying themselves. The ferry also had its share of traders selling food to the passengers. We found a nice guest house to rest up in for a while and catch up on the website and other chores. It is quiet with roosters frogs and birds providing background noise. Oh and the occasional human usually very early in the morning. At least the exchange rate was better. We have to wait for Pakse on Monday to exchange money at a bank. New Year was still in full swing, this time with water. Our windows were fully wound up so only the car was sprayed. If I had been walking the water would have been wonderfully cooling. In front of us a bus driver, with an open passenger area in the back actually stopped until the passengers were thoroughly drenched. No-one seemed to mind and happily allowed it to happen. There is nothing left of the ancient capital bar some mud walls visible from an aeroplane. The religious sanctuary Wat Phu is better preserved although many areas are closed off because of the danger of collapse. It is a Hindu sanctuary of Khmer architecture which was later changed into a Buddhist temple. The sanctuary stands at the bottom of Phu Kao which looks somewhat like a linga. Hence the sanctuary was originally dedicated to Shiva. There was a sanctuary in the 5th century but nothing of this remains. The current buildings were built during the 11th century by the Angkorian kings. Additions and reconstructions continued until the 13th century. The fresh water spring probably had a lot to do with the actual sighting of the temple. There used to be aqueducts leading from the northern spring into the sanctuary and permanently covering the linga with sacred water. The watering of the linga is a feature of the Hindu religion but the permanent nature of this watering is unique. At the bottom of the stairs on the northern side is a doorkeeper (Dvarapala) with a mace in one hand and the other on his heart. 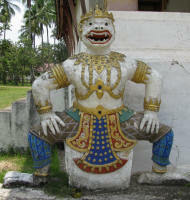 Local history identifies him as the king Kammatha, who is said to have built Wat Phu. He is still a point of worship. The southern doorkeeper has long gone. On the plain stand two palaces neither in good condition. The sanctuary is 100m above the plain but the steps are narrow and steep. Pieter stayed behind resting in the shade while I went up to look around. I definitely had my exercise for the day. Pakse has 3 international ATMs. Things have changed since our LP was published in 2006 when there was only 1 in the whole country. I am so glad not to have to part with more dollars. We visited 2 waterfalls. Tad E-Tu had pools for swimming but it was a long climb down the concrete stairs and up again. A group of young monks were enjoying themselves splashing around and sliding over rocks. I walked down to the second section which will no doubt also have a decent path down. There is quite a large resort being built at the top of the falls. It looks like it will be quite expensive when it is finished. Tad Fane consisted of 2 long drops. There was a trail to the bottom but it would have been a lot of effort in the hot and humid weather. I walked some way along part of the path over a ridge 50cm wide with a drop on both sides. At least the night was lovely and cool. We headed north to a third waterfall Tad Lo Waterfall is about 10m high. Again there were a few monks but there did not appear to be any decent swimming spots. This time there was no charge and the waterfall was very easy to see. A resort surrounds the falls. Once off the plateau we decided to head back to the main road north as the scenery was not exceptional. I doubt it was different to the main road. We followed a dirt 'main' road. There were many small rivers with wooden bridges over them. Two were badly in need of repair. Not much to report. The road went past virgin bush, slash and burn patches which will become plantations and rice paddies. The houses were sometimes built with walls made of horizontal wooden planks instead of the more usual vertical planks. The road goes near the Mekong at Thakhek and we were looking forward to stopping by the river. Unfortunately it was taken by houses and cultivated land. After driving along the river and onto a dirt road we found a spot to stay. Some rain came to cool us down. There were no problems arriving in Vientiane and finding a guest house to keep cool in while we obtain our Chinese visa. We have paid parking across the road along the Mekong. The first night we had dinner while watching the sun set over the Mekong and listening to music from Thailand just across the river. Friday was very productive. We submitted our forms for our Chinese visa, bought Pieter a pair of badly needed sandals and luggage for China and I finally had my glasses fixed. I broke an arm while snorkelling in Thailand and wanted to have new lenses as well as a frame. Alternatively a new arm only. The type of lens I want is just not available in Thailand, Cambodia or Laos. The glasses were being kept on by elastic but I was now fed up with this solution so decided to go for a new frame if I could not get the right type of lens. The optician had neither the lens nor a frame that fitted but he did have a set of arms. I now have mauve arms on my glasses! While waiting for the Chinese visa we visited some of the sights. 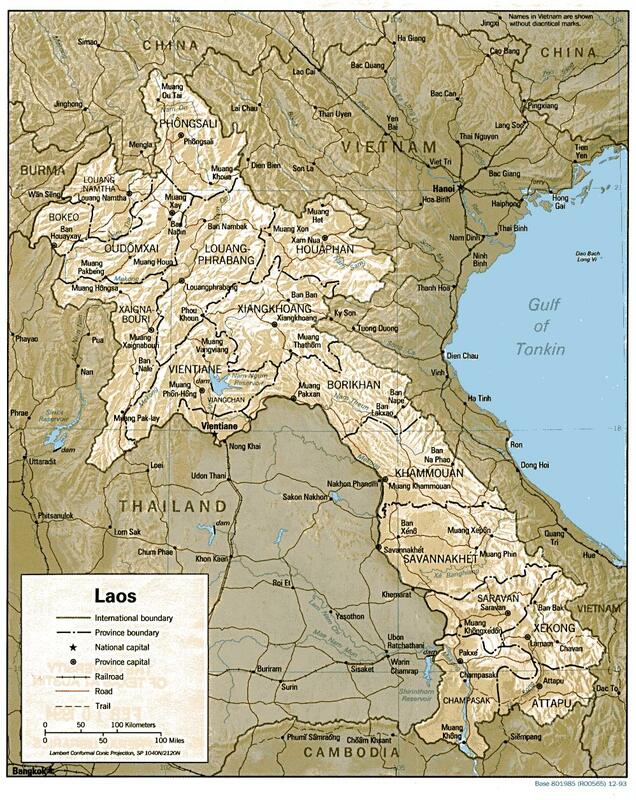 Pha That Luang is very important as the symbol of both Buddhism and Laos sovereignty. We arrived at lunch time and decided not to wait for it to reopen. In any case climbing stairs is not a favourite exercise. It is basically a very tall golden stupa. The original stupa was built in the 3rd century to contain a bone of Buddha. It was enlarged to its present size in 1566 and obviously painted many many times. Wat Si Saket was built between 1819 and 1824 and is the oldest temple in Vientiane. It is the only religious building spared when the Siamese put down a local rebellion in 1828. It is surrounded by a cloister of badly damaged paintings on dry plaster - not true frescoes which are painted on wet plaster. However there at least 100 Buddha statues all subduing Mudra. Ho Phrakeo Wat was built in 1563 to contain the Emerald Buddha. The Siamese took the Buddha to Bangkok in 1773. I know this makes it older than Si Saket but this is the info given out. Maybe it has been destroyed and restored? Patuxai the local version of the Arc de Triomphe. It commemorates the Lao who died in pre-revolutionary wars. Apparently it was built in 1962 using cement donated by America for a new runway but was never finished. To quote an official notice " from a closer distance it appears even less impressive, like a monster of concrete". Maybe the Americans objected! The official plaque says it was built with a grant from the P R of China. So were the Chinese cheapskates, the Americans duped or the Lao corrupt? The ceiling in the centre is quite ornate. What was interesting to watch were the official photographers. They take photos of customers in front of Patuxai and print them on the spot. I have not seen this new version of Polaroid before. Xieng Khuan (Spirit City or Buddha Park) is an eclectic collection of Buddhist and Hindu apparently cast by unskilled workers under the supervision of Luang Pu Bunleua Sulilat who founded the park. Interesting to see. We picked up our passports, vacated our room and had a big argument. This resulted in Pieter packing his bags and going off on his own. It is now my turn to have the van by myself. Our plan had been to go to Vang Vieng so I did. The road gradually goes up as it winds through the hills. The scenery was a great change from the flatness of the plains. My copper bracelet says it is less humid but it is still hot. I decided to follow the advice of Karin-Marijke and Coen of Landcruising.com and park in the Phoubane Guest House. Finding it was another story all together. I knew I was in the vicinity because of the GPS but where was it? I was directed down a small road close to the river and still could not find it. Eventually I was directed down a dirt road off this small road. I asked twice if the van would really go down there and was re-assured. In the end I walked down to see for myself, I just could not accept it as the road seemed so small with lots of overhead wires. The van could go but first I checked if I could park. I could for a fee so down I went. Once the van was parked I checked the room rates. A single room with shared toilet and shower cost the same. The room had a fan and electricity just outside so I decided to rather take the fan than sleep in the hot van. The view is terrific. Had a nice meal while watching the Simpsons, episode after episode. A lot of the restaurants have reruns of either the Simpsons or Friends, others ask you to bring your own DVD to watch while eating. It's OK a few times but they run the same episodes every day. The town is growing apace. New buildings are springing up everywhere including across the river. From my perspective across the river is not so good. 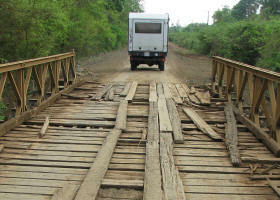 The road bridge has a weight limit of 2.5 tons and a height limit that looked about 3.5 meters. The van is 3.5 tons. The Nam Song river is very low at the moment so naturally all the small local children swim in it all the time and it is used to wash bikes. I asked about prices for cave tours but decided I did not really want to go for the single person price. 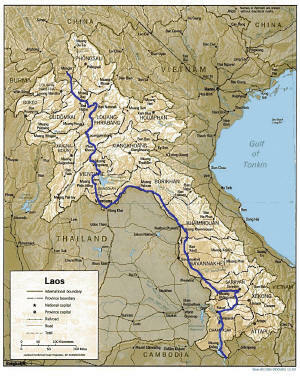 I found a tour (one of many) which booked individuals for 4 caves and kayaking back to Vang Vieng. When I arrived I was the only one so the trip had been cancelled, instead I went to 2 caves and kayaked back to Vang Vieng. It was great fun. The first cave was Long Water Cave. We had to sit in a tube and pull ourselves along a rope. Eventually the rope petered out and we had to walk a little way and connect to each other by putting our feet into the tube in front of us to make a long snake. The guide went first, backwards using his flip-flops as paddles and we all followed along. Everyone had to try and paddle over a tube - not so easy. There were 7 of us and 5 of us paddled, the honeymoon couple did nothing. They were last and we all made comments later about how they did not do their bit. At one stage I lost the tube in front. This meant the honeymoon couple and a young Japanese man were left behind. At first the honeymoon couple were actually going to leave it to the Jap! I told them they all had to work hard and I think they realised that for themselves as well. The cave itself was young and not very interesting from a speleological point of view. It was fun though. After lunch we visited the Elephant Cave, so called because of a rock formation. It had a Buddhist Shrine. Then it was onto kayaking. I was paired with the other older person in the group and it took us a while to get our strokes co-ordinated. Once we had that right it was a joyful experience. There were some rapids but very mild ones. We stopped about halfway at one of the many bars along the river. I was really glad of the break. Besides alcohol there was a slide and swing ropes to make jumping into the river great fun. Most of us just watched the people jumping in the water and laughing at their antics. Only one of us went down the slide and did a perfect landing. He had not been drinking alcohol. People also hire tubes, go to the bars by road and flat back down. All in all it was a lovely day. 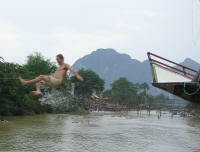 Vang Vieng Resort has many picnic places, Tham Jang Cave and a swimming hole. I joined 4 Australians who had quite a lot of knowledge about caves which made the visit to the cave itself interesting. Again it is a young cave so although there are formations they are small and therefore not that spectacular. The view from one of the openings was good. The best is the water hole. When we arrived there was a large Lao family swimming there. We waited for some of then to come out before going in. There is a cave here too and we swam up into it much further than I would have on my own. One person had a torch so we went around a corner where we could no longer see the light from the entrance. Then the torch went out. Naturally we all joked that he had done this on purpose because it was pitch black. He had to tell us 3 times that he was NOT joking before we believed him. At least we had some idea which direction we had to go and we were not that far in anyway. We all linked hands and swam in the right direction until we could see the light. Then it was easy. No-one even hurt themselves on the sharp rocks jutting up from the top and bottom of the cave. It was great fun! Pieter arrived in Vang Vieng on Sunday to help ensure the van is safely stored in Oudomxai. Once again the scenery was magical. I drove for an hour or so then Pieter's desire to drive fully surfaced so he took over. Unfortunately there was a lot of haze which is very atmospheric but not conducive to good photos. We had some possible places to park in Luang Prabang. In fact these were not needed. The old town area is on a peninsula formed by the Mekong and Nam Khan rivers. There is plenty of shaded parking along the peninsular. Once again the heat and humidity meant we parked on the street but stayed in a hotel. I had hoped to see the Grand Palace but just my luck it was closed on Tuesday. I did see several temples though, not always close up. It becomes a bit much when every temple asks 20,000 kip. It is not a lot of money but there are just so many temples you can see without getting templed out. The temples on the hill of Phu Si are fairly recent but the climb gives a good view of the town. I went into the cave temple of Wat Tham Phu Si and could see very little. As my eyes adjusted the meditating monk became apparent. Probably not good manners but I took a flash photo. The monk did not even notice. The original Wat was built in 1395 at the sight of a Buddha footprint. This is actually natural hollows in the rock that look more or less like a footprint. There are statues of Buddha in various poses, a different one for each day of the week. Interesting, but I do not remember what he was doing on a Wednesday. Wat Wisunalat (Visounnarath or Visoun) was built in 1513 and is the oldest continuously operating temple in Luang Prabang. I only saw the outside but inside there is apparently a collection of calling for rain Buddha statues. Outside there are guardians in the form of a God, a Demon and two lions. Wat Mai (Wat May Souvanhnaphoumaram) is right next to the Palace and was for me the most impressive. Not because of the inside but because of the gold pained carved reliefs on the front wall. I took so many photos it was hard to choose which ones to use. Each panel had worshipping the Buddha statue at the centre but it was the reliefs of the ordinary people that caught my fancy. Wat XiengThongRatsavoravihanh was built in 1560 and under royal patronage until 1975 when the communists took over and the king was exiled to the north never to be heard from again. I did not go inside, maybe on the return trip. I found the centre piece of the roof interesting. 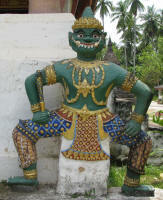 Similar decorations are on other temples in the area. When walking around I came across many sights, such as scorpians in whiskey at the night market, sculptors busy at work and corn with grey/black kernels. The corn was a little tougher than yellow corn but still tasty. The road deteriorated but the views did not. We left late and arrived in the heat of the day so it was not until next morning that we went looking for a place to park the van. My information was that the Fire Station was a good bet. Unfortunately the Fire trucks are parked at the Police Station and NO we could not leave our van there for 6 months. We spent the morning going from place to place eventually negotiating a price with the Dan va Vant Hotel and paying 4 months in advance. They have under cover parking but with a height restriction of just over 2 meters. I did what I could to prevent rain damage inside during the coming monsoon. We will see how effective that is later. I was very gladto have Pieter along to share the frustrations of finding a place to park the van. Now our Lao money was starting to run low. There was enough for the tickets to Mengla in China and a slap up dinner at the Kanya Restaurant. For lunch on Thursday I bought 1 portion of chicken and vegetables with rice to take away. Pieter and I ended up eating both lunch and dinner from it. Their portions are delicious and huge! On the drive through the border I did not notice any suitable place to leave the van, so leaving it in Oudomxai seems to have been the best solution.